This medication resource is designed specifically for school-based mental health providers (e.g., school counselors and school psychologists), and other educators working with students with mental health challenges in school settings. This concise guide provides information about frequently prescribed medications for children, including guidelines for monitoring medication use, documenting the effects of treatment and relevant side effects, as well as strategies for collaborating with families and health care providers about implementing treatment plans. 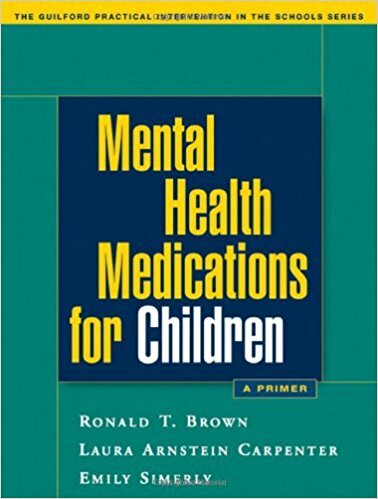 This guide includes reproducible tools, such as medication logs and observation forms, as well as lists of common mental health medications for children. Dr. Ronald Brown is Professor of Public Health, Pediatrics, and Psychology, and Dean of the College of Health Professions at Temple University. Dr. Laura Arnstein Carpenter is Assistant Professor of Pediatrics at the Medical University of South Carolina. Dr. Emily Simerly is Clinical Director of the Mental Health Unit at the Georgia Diagnostic and Classification Prison in Jackson, Georgia. Brown, R., Carpenter, L. & Simerly, E. (2005). 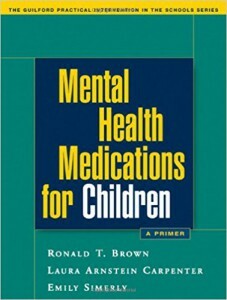 Mental health medications for children: A primer. New York: Guilford Press.